I had never heard of this book or its author until a friend bought it for me as a present. But it proved to be a really worthwhile read. Nancy is Professor of Apologetics and Director of the Center for Christian Worldview at Houston Baptist University. She is involved in other organisations and projects, and has also written a number of books. With that background, we can expect her to be knowledgable and able to express her ideas well. This book bears that out. Nancy grew up in a christian family, asked a lot of questions in her youth which weren’t answered, and so became an agnostic. She later reconverted when she found answers to her questions. One of the motivations behind this book is the story, which Nancy has heard many times, and which she lived out herself, of a child of a christian family giving up on their faith in their teens because they couldn’t get answers to the questions they were asking about God and life. Some conservative churches and christians oppose “critical thinking” and intellectual approaches to christianity, apparently thinking that God’s word is enough, and human thinking is opposed to God. But Nancy argues opposite to this, that “critical thinking saves faith”. We cannot hide from information these days, she says, even if we wanted to, so we must all “become independent thinkers with the tools to think critically about diverse points of view”. We must learn to be able to examine both sides of arguments. 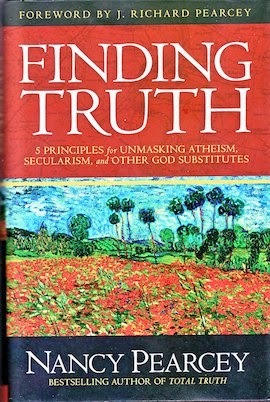 Nancy argues that alternative belief systems – materialism or naturalism, postmodernism, determinism, etc – all take some aspect of truth and magnify it to be the full basis for their worldview. So materialism makes the created, physical world to be all that exists, empiricism says that the only things that can have meaning are what we can detect with our senses, and so on. She then suggests a 5 step process to …. show how christianity better accords with what we know about the world. Take materialism as an example …..
Materialism is the belief that the material, physical matter, is all there is. This is reductionist because it leaves out the non-material. Thus it is claimed that things like our minds, consciousness and ethics can all be explained in material terms. For example, if matter is all there is and matter is governed by physical laws, then logically we cannot have any genuine freewill choice – all our thoughts and choices are governed by the physical processes in our brains, and there is no “us” outside those processes to control them. This view contradicts the way we experience the world, where it seems like we have free will, and our ethics and law are based on that perception. Nancy shows from direct quotes that while scientists and philosophers may accept this consequence of materialism when thinking about it, they cannot shake the feeling at other times that we do have free will, and in fact most admit that we couldn’t live any other way. So, she argues, if everyone experiences free will, the view that we don’t have it contradicts our experience. Further, the view is self-refuting, for if our brains operate on determined physical laws, our conclusions are determined by those laws and we couldn’t have concluded anything else. Our brain states are biological facts, and such facts can’t actually be true or false, they just are. So we have undercut our ability to know truth, including our ability to “know” that materialism is true. So we have good reason to think materialism is false. Christianity, on the other hand, says we are more than material, that we are made by God with minds that really can perceive truth, however we may sometimes make mistakes. Christianity explains the world we experience better than materialism. These thoughts are not new – writers and philosophers like CS Lewis, WL Craig, Alvin Plantinga and Thomas Nagel have pointed them out before now. But Nancy has expressed them in a clear way with many, many quotes and references, within a systematic framework that makes it easier to apply the thinking she recommends. I will certainly be using those quotes! But I am doubtful if this book will make a big impression on non-believers, for it seems to me that many people these days have inconsistent worldviews, and it doesn’t seem to bother them much. Nevertheless, I recommend this book as a good introduction to some interesting and helpful philosophical ideas. Filed Under: clues Tagged With: Arguments, Atheism, Evidence, God, Mind, Philosophy, Reason, What is human?